U.S. News & World Report’s new rankings name the University of Nebraska at Omaha’s (UNO) online criminology and criminal justice graduate program the nation’s No. 1 program of its kind. The 2019 Best Online Programs Rankings, released Tuesday, Jan. 15, weigh factors that include student engagement, faculty credentials, services and technologies, as well as expert opinion. UNO’s online Master of Science in Criminology and Criminal Justice degree placed first in its field and the online undergraduate Bachelor of Multidisciplinary Studies ranked in the top 15 percent of all online undergraduate programs. Both programs are housed in UNO’s College of Public Affairs and Community Service. CPACS Dean John Bartle called the rankings validating. "The rankings tell us what we already knew: UNO is No. 1. We have outstanding faculty. Our curriculum is practical. The world is changing rapidly and we prepare students for the future, not the past. When you marry quality with flexibility and affordability you have a winning combination." Gaylene Armstrong, director of UNO’s School of Criminology and Criminal Justice, said flexible coursework is especially important to their students, the majority of whom are criminal justice professionals looking to advance their careers or students who plan to seek leadership positions within criminal justice agencies and related organizations. "We are proud to set the standard for criminology and criminal justice graduate education," Armstrong said. 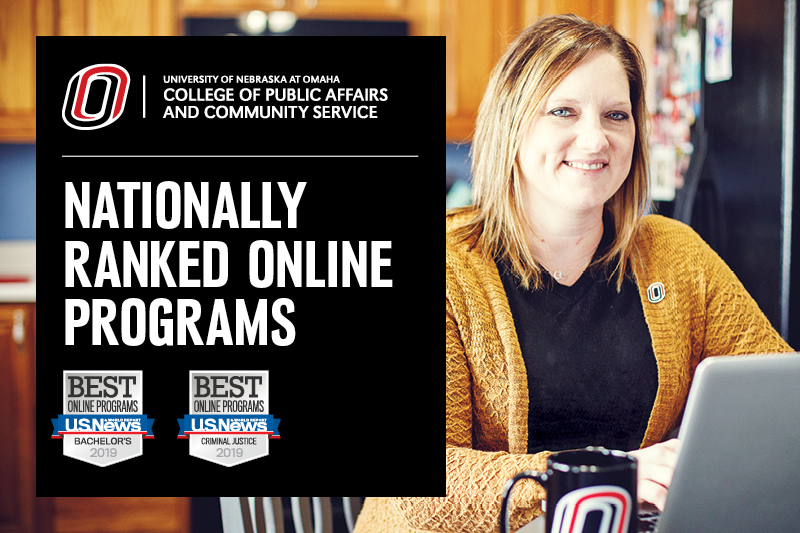 "Students choose UNO because they know their experience, online or on-campus, will help them become leaders in their agencies and organizations. Whether a student’s research interest is corrections, policing, victimology or global terrorism, we have nationally recognized faculty on our team to help them achieve their academic and professional goals." UNO’s Bachelor of Multidisciplinary Studies made a strong showing, ranking No. 49 out of nearly 400 ranked programs. The program offers dozens of concentrations, allowing students to design an individualized program of study. The BMS degree is part of UNO's Division of Continuing Studies, whose staff provide a wide range of services to those seeking degree completion, including over-the-phone advising and transcript review for prospective students. "Our philosophy has always been to meet students where they are," DCS Director Christine Billings said. "That’s why we have a generous transfer credit policy that accounts for nontraditional learning like military service. Our mission is to help you meet your goals with a program that fits your life." UNO has continued to grow its online programming in recent years. The university offers eight fully-online undergraduate degree programs and eight fully-online graduate programs. All of UNO’s general education requirements can be completed online.